I have now been the choir director for over two years, I am not musically talented so this calling can be a bit of a challenge. When I was called I hoped there would be a good online support group for LDS Choir Directors but I never did find such a group. So, in hopes to help out some other struggling choir director here is my Christmas program from last year (my program from 2 years ago can be foundhere). All we ever use in our choir is music from Hymnplicity, (Hymnplicity Ward Choir Book 1 ) which has been my saving grace through this calling. We have also started a tradition of singing Joy to the World with the piano AND organ playing at the same time to finish our Christmas program. It turns out GREAT every year! The music we use is from Sally DeFord, you may link to her site HERE. For the basis of this program I simply took a primary song, Oh Hush Thee My Baby and expounded on each principle. Each year as we watch the Christmas lights and decorations appear in the shops and on the streets we can sense the excitement of the upcoming celebration. The trees, the lights, the gifts and the stars are symbols that surround our holiday festivities. Mothers and fathers hope and pray their children will recognize the significance of these objects and remember why Christmas is a story of salvation and eternal life. (John 3: 16-17) “For God so loved the world, that he gave his only begotten Son, that whosoever believeth in him should not perish, but have everlasting life. We begin today with a story told by our children. We know this story well but we would be wise to take a moment and look deeper to understand the purpose of this miraculous chain of events. The story originates, not with a baby in a manger but with a young virgin woman named Mary and the faithful obedient man, Joseph. 27- To a virgin espoused to a man whose name was Joseph, of the house of David; and the virgin’s name was Mary. 28- And the angel came in unto her, and said, Hail, thou that art highly favoured, the Lord is with thee: blessed art thou among women. 31- And, behold, thou shalt conceive in thy womb, and bring forth a son, and shalt call his name Jesus. It was prophesied that the Messiah would be born in Nazareth and be called a Nazarene. Jesus was conceived and raised in Nazareth in fulfillment of prophecy. Yet another prophecy must be fulfilled. It was well known that the promised Messiah would be born in Bethlehem of Judaea. Since Mary was about to have her first child and would be particularly anxious to be at home near her own mother and family, how could the prophecy of the birth be fulfilled in Bethlehem—nearly one hundred miles away from Nazareth? It was not by chance that Roman administrators decided to conduct an enrollment for the purpose of taxation, which sent thousands throughout the country back to their ancestral hometowns. Joseph and Mary set out on a long and difficult journey south to Bethlehem. 5- To be taxed with Mary his espoused wife, being great with child. 6- And so it was, that, while they were there, the days were accomplished that she should be delivered. 7- And she brought forth her firstborn son, and wrapped him in swaddling clothes, and laid him in a manger; because there was no room for them in the inn. 1 min 20 sec- The story was told by the angels so bright, As round them was shining a heavenly light. When the time for this Savior’s advent was at hand, an angel was sent to announce to Mary that she was to be the mother of the Son of God. Then a host of angels was commissioned to sing on the night the baby Jesus was born. Shortly thereafter an angel would announce to Joseph that the newborn baby was in danger and that this little family must flee to Egypt for safety. When it was safe to return, an angel conveyed that information to the family and the three returned to the land of their heritage. From the beginning down through the dispensations, God has used angels as His messengers in conveying love and concern for His children. 1 min- The stars shone out brightly, but one led the way and stood over the place where the dear baby lay. 9- And, lo, the star, which they saw in the east, went before them, till it came and stood over where the young child was. 10- When they saw the star, they rejoiced with exceeding great joy. The star that led the Wise Men to the Savior was real. But it was also symbolic of the light that came into the world with the Savior’s birth. The Savior is the Light of the World. He is the sure guide for each of us. His light persuades us to do good; it leads us to Him. The path of life leading to eternity is illuminated by this light. 10- “But he that entereth in by the door is the shepherd of the sheep. 15- “To him the porter openeth; and the sheep hear his voice: and he calleth his own sheep by name, and leadeth them out. 17- “And when he putteth forth his own sheep, he goeth before them, and the sheep follow him: for they know his voice. Symbolically, a shepherd is a person who cares for the Lord’s children. Christmas still needs shepherds. Some people need to have shepherds; all of us need to be shepherds. 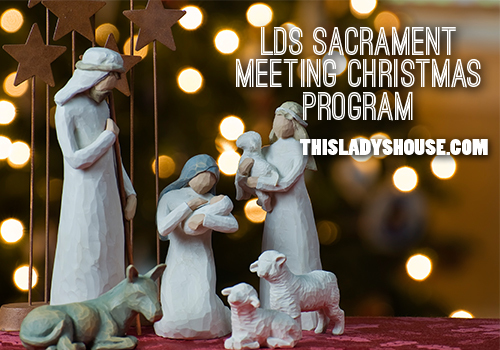 Let us be, together, people sharing the joy of our Savior’s birth with one another. Who is this child, born in a manger, wrapped in swaddling clothes, what was his purpose and why did he come? Elder Russel M. Nelson teaches us that indeed, all of our many blessings—stem from our knowledge of, obedience to, and gratitude and love for the Lord Jesus Christ. During His relatively brief sojourn in mortality, the Savior was sent to accomplish two overarching objectives. One was His “work and [His] glory—to bring to pass the immortality and eternal life of man” (Moses 1:39). The other He stated simply: “I have given you an example, that ye should do as I have done” (John 13:15). “I came into the world to do the will of my Father, because my Father sent me. “And my Father sent me that I might be lifted up upon the cross; and after that I had been lifted up upon the cross, that I might draw all men unto me” (3 Nephi 27:13–14). In continuing His sermon, He revealed His second objective—to be our exemplar: “Ye know the things that ye must do … ; for the works which ye have seen me do that shall ye also do” (3 Nephi 27:21). This entry was posted in Uncategorized and tagged Choir.